A Magnificent Town and Its Flying Machines: Crayford’s industrial heritage and role in early aviation history Project. The story of Crayford’s role in early aviation history and the town’s industrial heritage can be told thanks to a £50,000 grant from Heritage Lottery Fund (HLF) awarded to Bexley Local Studies and Archive Centre in 2009, to develop a range of activities and resources to tell the little known story of how one small town made such a big impact on the world of aviation and industry. 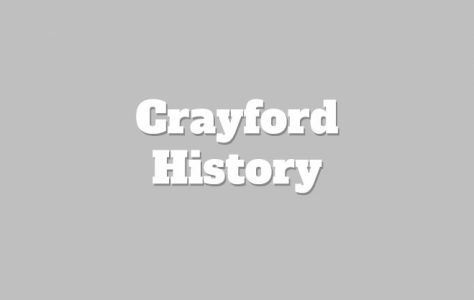 An education resource booklet, “A Magnificent Town and Its Flying Machines: Crayford’s role in Aviation History” was especially written for the project and is freely available from the Resource page on this website. Bexley Local Studies and Archive Centre delivered sessions to 360 children from St Paulinus CE; St Josephs RC and Temple Grove, formerly Barnes Cray, primary schools in Crayford. Over 150 young people rolled up their sleeves and used their creative skills to paint 5 murals on panels. At sessions held at Crayford Library, St Paulinus CE Primary School; St Josephs RC Primary School, Crayford Temple Grove Primary School and Shenstone School children worked on their individual panels, with Artist Jonathan Boast who had carefully considered important aspects of Crayford’s history in his initial design. 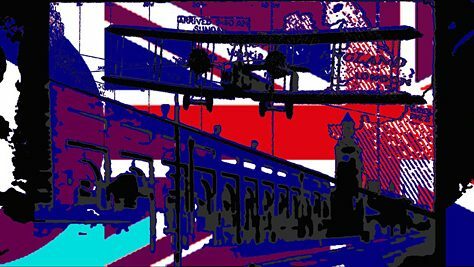 BFI animator, Tom Hillenbrand delivered animation workshops to 115 children in Crayford Library and three Crayford primary schools to create the Magnificent Town animation, which can be viewed on this website. We hope you enjoy viewing it as much as the children enjoyed making it. Tom Hillenbrand has been running a range of animation and live-action filmmaking as well as graphic design workshops with people of all ages since the mid 1990’s. Tom’s recent projects include ‘Crossing the White Line: The Walter Tull Story’ and ‘Not Forgotten’. Clients include British Film Institute, Barbican, Westminster Archives, Tate Britain, Design Museum, Lambeth City Learning Centre and Creative Partnerships. 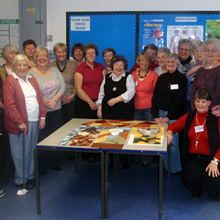 Using artwork created by Crayford School children the Dartford Quilters Groups have made a decorative patch work quilt depicting the industrial history of Crayford. Year 6 children from St Josephs School performed their opera at the end of project celebrations at Hall Place on the 8th July 2010. The opera was composed by Russell Hepplewhite, directed by Helen Eastman with help from music teacher Penni Cliburn.